This book’s narrative being written chronologically, I confess to having read it only through the chapter that covers through 1801 (because the stories I’m working on take place in 1800). But what I did read (nearly 300 pages) was extraordinary. For someone like me, who was craving details on the political and social contexts of an era, it was a gold mine, not just of data but also of enlightenment.In a multitude of brief chapters that focus on specific aspects of the topic (particular military engagements, the effects of war on various trades, government policies and finances, political and philosophical debates, the state of the rural poor, etc. ), Uglow presents a complex and comprehensive picture of England during the Georgian era of war with France. Clumps of chapters are grouped chronologically: 1789–92, 1793–96, 1797–1801, and so on. This approach allows the reader to grasp the big picture while still absorbing detail.The narrative relies heavily on primary sources—journals, letters, publications of the era—but the underlying scholarship, unlike some works of this kind, is also informed by extensive secondary reading. There is a very useful bibliography, and even more gems are to be found in the notes. Uglow writes in a readable style, without a lot of scholarly jargon and without getting bogged down in the weeds of academic debate. This is real history for the lay reader. Highly recommended! 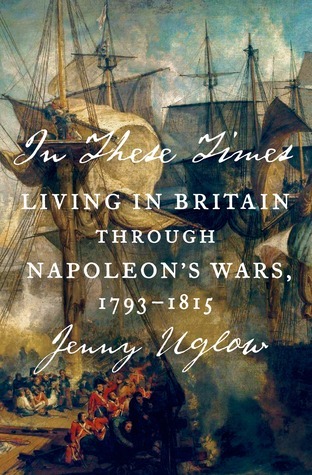 A wonderful look at life in Britain throughout the Napoleonic wars. Uglow weaves personal narratives seamlessly throughout using excerpts from letters and diaries. We also see poets, novelists and painters. She shows how peoples' focus was often not on war but the day-to-day realities of children and jobs and getting sufficient food. Yet of course war played a role if sometimes unspoken in all of these things. Uglow writes of the political protests and riots such as those over the corn laws, peace and over the entry of machinery into both the work and political life. Her compassion for those suffering from higher prices and fewer (and low-paying) jobs comes through. A great work for just about anyone who loves history. Only Jenny Uglow could write a 700 page book about England during 1793-1815 using mostly primary sources--many of them personal, like letters and journals--and make it look effortless. It took me a long time to finish this book, mainly because I didn't want to. I wanted it to keep going. My copy is more highlighted and tabbed than any law school casebook was when I was school. Anyone interested in the Regency should read this, as should military history buffs. It's not that it's the ultimate in comprehensive--nothing could be, not even in 700 pages. And there were times when I thought, "Hm...I'm not sure that's quite right" when it came to some naval issues. (And there were sources that I wouldn't particularly have chosen, either.) But this is Jenny Uglow, who is known for her biographies of lives, great and small (her biographies of Charles II and of Thomas Bewick are both delightful), and here she pulls off the biography of a nation. You will come away with a deeper understanding of how England changed during its long wars with Napoleon (and how completely, obnoxiously, and historically erroneous most Regencies are when they include soldier/sailor characters). I read this because it sounded like it would be an interesting look at Jane Austen's time. Jane is quoted, but so are her brothers. And so are an astonishing number of others. I lost track of this or that person, but their individual stories aren't so important as getting a feel for the zietgest of the times. Uglow's retelling of a botched French "invasion" and the general paranoia of impending invasion reminded me of scenes in Hardy's The Trumpet Major. I appreciated learning about how much money soldiers made, and the difference between militia and regular army. The short chapters made it good reading while on an exercise bike or eliptical. The only downside is that sometimes Uglow gets into the weeds a bit too much. I wish there had been less material on banking and economics. This simply isn't my kind of book. The focus is incredibly wide: men, women, people of all classes and walks of life, as long as they were alive during the Napoleonic wars this book will talk about them. And that makes it somewhat jumbled, jumping back and forth between so many different people with different views and problems. For others, this book might give a great overview but I simply prefer a narrower focus. I was drawn to this book by admiration for Jenny Uglow's excellent biography of Charles ll and my fascination with the Napoleonic period. The author has set out to write a social history from the viewpoint of a wide range of people living in Britain at a time when, in addition to the threat of a remarkably successful military opponent, they had to contend with the throes of the Industrial Revolution and a growing demand for democracy.Using a framework of themed chapters, each ending with an impressive list of sources researched, Jenny Uglow quotes widely from letters and journals, and recounts the exploits of those who may not have had much truck with writing, such as the blacksmith who led a group of "labourers wearing skirts to look like housewives" who "marched through villages crying 'We cannot starve", and wrecked a mill that was supplying the navy rather than the people of Devon. He was hanged at the same mill "with great ceremony", whereas other ringleaders sometimes escaped with the lesser punishment of transportation.Jenny Uglow contrasts a hidebound parson who feared that the French Revolution would spark unrest in England, with the respectable, liberal-minded men who joined more anarchic colleagues in urban pressure groups calling for political reform. At first quite nonchalant about a foreign uprising which he expected to be short-lived, first minister of state William Pitt was driven in due course to take a tougher line, banning societies and public meetings and suppressing free speech as ferociously as a modern dictator. The author is good on the direct effects of the war with France, such as the way troops waiting in coastal ports for the order to attack commandeered so much food that the local people began to go hungry.I was less impressed by chapters which seemed to ramble off at a tangent into a morass of detail. An example of this is "Warp and Weft" which seems to belong more to a book specifically on the Industrial Revolution. I learned that "to add strength to the cotton, weavers added `fustian', wool or linen yarns, to make the warp", and that Robert Peel, son of a future Prime Minister, employed in his factories children who had no shoes or stockings, visiting Poor Law Guardians being informed "if they gave them shoes they would run away". These points had to be teased out of a mass of information on a few weavers and mill owners - arbitrarily chosen except perhaps that they happened to have left records.The brain can only absorb so much "dissociated" fact and it becomes distracting to be continually asking, "Why am I reading this? What does it have do with the impact of Napoleon on the lives of ordinary people in the British Isles?" I realise that this is a question of taste, and some people thrive on detail, plus it may be of value to students, but I would have preferred a shorter text with a stronger focus on the Napoleonic Wars and their impact on Britain. I coped with the book by skipping through some passages to find what interested me, but that is not entirely satisfactory in what I do not think is intended to be a reference work. Whirligig tour of UK during wartime; great range, less depth (on purpose). Good basic review of the period. I like that even with a cast of thousands we return to certain families as the years pass and observe events as they affect people all along the social strata. It does get to feel breathless at times; I'd recommend you take short breaks between sections if your memory is good enough to keep the central families in mind through the break.Huge respect for how many memoirs, diaries, letters, newspapers, and business papers she sifted through to find great quotes and enlightening stories. I treasure her bibliography and notes ;-) Scores of illustrations; helpful and important to the stories. I was lucky enough to pick this up as an uncorrected proof for $2.50, as opposed to $40.00 on publication. A good deal by anyone's standards; especially as it's a wonderful ramble through British life, high and low, urban, rural and overseas, in the Napoleonic wars. I read it at the same time as The Age of Wonder, which overlaps it in time, before and after. Jenny Uglow doesn't really have much to say about the great scientists, or the great poets for that matter, in all her big book; nor does A of W have much to say about the wars or their impact -- so the two together make a sort of of panopticon for the times. Excellent. A comprehensive look at life in Britain during the Napoleonic Wars. Recommended to authors doing books set during the period. It's also a good choice for readers who enjoy stories of the Regency era, especially military fiction from the early 19th century (Hornblower, Sharpe, Aubrey & Maturin), etc.There's nothing like first person accounts for entertaining anecdotes and reports of day-to-day life during wartime. The author's research and organization makes the book highly readable as well as useful. As monumental as the research was, the book was a slog. Unless you love and are skilled at reading old English vernacular, often facing words long ago discarded, reading In These Times will make you feel like your rowing across the Atlantic or climbing Everest. I've labored through 1/7th so far. I rarely give up on books, even challenging ones, but if the direction and thrust of this one doesn't evolve soon, I may have to donate this a library and have it collect dust there. The book is well laid out and easy to navigate and has a wealth of information on the time period. I've read so many books about this era that it's difficult to find new information that I haven't come across before and this one had quite a bit that was new to me. It's a bit dry, but I think it's good for anyone wishing to more about the Napoleonic wars. Such a promising topic, but I found that the level of detail and thematic (i.e. non-chronological, anti-story-like) organization sapped all forward momentum. ‘In the year of the Helpston enclosures Turner exhibited an oil in his private gallery, Ploughing up Turnips, near Slough. Men plough and women follow, bent double to grub up the roots, one stopping to nurse her baby in the field. A man mends a broken plough and cows munch the turnips spilling from a pannier on the ground. In the background, rising above the woods in a morning mist, is Windsor Castle. Is this a version of digging for victory, a celebration of progressive agriculture, watched over by a benign Farmer George? Or is it a scene of hardship, a slough of despond next to wide royal estates, where women and old folk toil as the young men march to war?’I’ve been slowly reading through 'In These Times: Living in Britain Through Napoleon's Wars, 1793-1815' by Jenny Uglow over the last couple of months, picking it up while reading in bed or between other books. It suits well in that regard, being a long historical account of the Napoleonic wars as told through primary sources: the actual letters, journals, essays and other written accounts by people who lived through that era. It’s an approach which is nearly devoid of historiographic wrangling, though it brings its own other problems; since the fragments are necessarily isolated, the author has to do a great deal of narrative busywork in piecing them together so they seem like a coherent tapestry of tales. It isn’t an easy war to explain; this was, to put it lightly, a complicated time for Britain, which was then emerging as one of the world’s dominant superpowers.What is most striking considered now is the sheer scale of economic output required to keep the war rolling. For much of the book, Britain seems to be teetering on the edge of starvation, and the people at home faced genuine hardship as a result.‘…Later accounts, eerily precise, put the cost of the war at £1,657,854,518. This was three times the cost of all other wars since 1688 and six times the pre-war national income…’Eventually the government found itself in so much debt that a tax on income was introduced — hitherto unthinkable, and in the days before tax returns, an administrative nightmare. And that’s assuming you had any money at all; if you kept it in the local bank, and they went bust (as many did) you were effectively ruined. Most significant was this particular early decision (which is still ascribed by some internet lunatics to Prime Minister Gordon Brown) to abolish the gold standard:‘…At this point, on the Saturday after the stoppage, Pitt held an unprecedented cabinet meeting, with the Bank directors in attendance, and the king agreed to a Privy Council meeting on Sunday. An Order in Council then allowed the Bank to issue notes without the need, or promise, to back them up with gold: the Bank, and the country banks, could issue notes of under £5, and the first £1 and £2 notes began to appear. It was hard for people to see these new notes as ‘real’ money – five years later a hatter’s wife in Oldham used three £1 notes to kindle the fire, ‘fortunately for the Bank of England’, wrote Rowbottom drily…’Not that this prevented a few men getting extremely rich from the waging of war. This was particularly true of the arms and clothing industries: if you were well placed to make and supply guns, uniforms and other military supplies, you could make a killing from government desperation. The creeping industrialisation of Britain, marked by the gradual introduction of mechanisation and specialisation, made the war possible; it was effectively the birth of the military industrial complex. And if you were able to lend money to the government, that placed you in an especially strong position. There’s an astonishing story here about Nathan Rothschild, the grandfather of that famous banking dynasty, and how the British government had him circumvent their own laws on exports to the continent in order to have the Duke of Wellington pay for local expenses for the fighting in southern Europe:‘When I was settled in London’, he told Thomas Fowell Buxton: ‘the East India Company had 800,000 lbs of gold to sell. I went to the sale, and bought it all. I knew the Duke of Wellington must have it … The Government sent for me, and said they must have it. When they had got it, they did not know how to get it to Portugal. I undertook all that, and I sent it through France; and that was the best business I ever did.’But all of this was very far from the experience of ordinary people. At first, few saw it in such opportunistic terms; for many years, this was not a popular war. Wages and conditions for sailors and soldiers were poor, and in some parts of the country the ‘press gangs’ who tried to force the local men into the navy were driven out of town by rioting townsfolk — men and women alike. In other places, people banded together to smash machines which deprived them of jobs they might have held for the rest of their lives; these were the days of the Luddite rebellions, which further complicated the already tricky business of maintaining supply lines to military fronts that stretched all over Europe. Working people also had to worry about the process of enclosure that had been happening in a piecemeal fashion for many years, and which deprived folk of common land used for keeping animals, as well as rights for hunting and fishing:‘…Describing an altercation with the Duke of Portland’s forester, who stopped him collecting nuts in a wood near Hexham, he asked what had happened to the people’s birthright. If the French invaders came, he asked, and ‘jeeringly ask what I am fighting for? Must I tell them for my country? For my dear country in which I dare not pluck a nut? Would they not laugh at me?’ Rather than stand for that he would throw down his musket and say: ‘let such as the Duke of Portland, who claim the country, fight for it, for I am a stranger and sojourner, and have neither part nor lot amongst them.’…’In the years after the French Revolution, Napoleon was not short of supporters in Britain; people saw him as a liberator, a great alternative to monarchy, aristocracy, and a corrupt government dominated by ministers in charge of ‘rotten boroughs’ that would barely be considered democratic today. He attracted idealists like Wordsworth and Coleridge, though many of them would later regret their enthusiasm once his dictatorial intentions became plain in later years. But harbouring sympathies, even privately, was a dangerous game, as many found out:‘…William Blake, who had moved to a cottage at Felpham in Sussex, was one victim of this new alarm. On 16 August 1803 he appeared before the Chichester justices accused of seditious language and assault on a soldier, John Scofield, whom he had thrown out of his garden. Scofield swore that Blake had said that ‘The People of England were like a Parcel of Children, that they would play with themselves till they got scalded and burnt, that the French knew our Strength very well, and if Bonaparte should come he would be master of Europe in an Hour’s time’. Blake’s wife Catherine ran out of the cottage, allegedly shouting that she would fight for Bonaparte as long as she could. Matters dragged on miserably until Blake was acquitted in January 1805…’Blake got off lightly in this case; the serious Jacobins, inspired by the likes of Thomas Paine and sympathetic to the revolutionary mindset, were regarded as intolerably radical. Next only to the threat of actual invasion by the French was the nightmare scenario of revolution in Britain, and the government regularly took steps to prevent this via the most oppressive measures conceivable. There was no question of freedom of speech. The principle of Habeas Corpus was frequently suspended, and it was treason to incite hatred of the king; in a deliberately vague choice of words, it was even illegal to ‘bring into contempt’ the king or the government. This might have quelled public debate, but it did little to arrest popular uprisings against authority. The lack of a standing police force meant that protests and riots were invariably handled by militia, and as such, many ended with local soldiers firing upon local people. Ultimately, Uglow’s book serves as an essential reminder of the way in which the war required fighting on two essential fronts: one in the defence of the country from the French, and one in the defence of the people who ran the country from the people who worked it. At just shy of 650 pages (of small print) In These Times is a potentially challenging read. However Jenny Uglow has managed to create an utterly compelling and readable social history of Britain during the late 1700s/early 1800s.I've previously read a bit of military history during the period (Mark Urban, Sam Willis, Richard Holmes), but this account of the Revolutionary and Napoleonic wars takes the understanding of the era to a completely new level for me.As you'd expect we hear from the giants of the age (Napoleon, George III, Pitt, Fox, Paine), the literati (Austen, Wordsworth, Byron, Scott, Burns, Cobbett), the military (Nelson, Wellington) and other luminaries, but the real strength of Uglow's work is the voice of the ordinary and everyday. Drawing from a vast range of material including farmers, labourers, bankers, industrialists, soldiers, sailors, etc, etc. We get a deep impression of life during those troubled decades.So absorbing is the text I at one stage found myself anxious on behalf of the "characters" during the very real threat of French invasion, not to mention the heart-breaking accounts of loss and death that sometimes felt uncannily modern (an expeditionary force being evacuated out of Dunkirk and the low countries was particularly striking).As Britain struggled and stood alone as the lights of Europe went our one by one (to borrow a phrase), we read of an international network of trade and banking being organised on a staggering scale (timber for warships imported from as far away as New Zealand) and finance the equivalent of billions in today's value being organised from international institutions.Uglow covers the huge improvements in farming and manufacturing as steam in particular is utilised and also accounts for the human cost, including the child mortality in industrial accidents and the brutality of the Highland clearances. She also records the period when habus corpus was regularly suspended, civil unrest almost brought about a British revolution, violence in Ireland reached new heights and the poor were disregarded as another species to live and die according to their fate.Taxation was ramped up to new levels to include paper, clothes, horses, carriages and even servants (while not forgetting the unprecedented and “temporary” introduction of an income tax). Business and industry experienced boom and bust several times over – companies such as Wilkinson Swords, Pickfords removals, Barclays, Barings, Whitbread the brewers all appeared and grew during these times and of course that commercial/military machine called the East India Company spread it’s sinister shadow making the modern day tech giants seem like benign minnows by comparison.This book will give you many “I didn’t know that” and “oh that makes sense” moments, as we begin to recognise embryonic elements of the world we experience today.It will take a while but if you have an interest in the era this will probably be one of the most rewarding reads of the year. There aren’t many 641-page, profoundly researched social histories that I wish were longer—but this is one of that uncommon breed. I’ve been reading about Britain during the Napoleonic era for some fifty years, and I think this is the best and most moving chronicle of that tumultuous and agonized age since the appearance of E. P. Thompson’s Making of the English Working Class more than a half-century ago. A first-class historian, Uglow has many gifts, among them an impressive familiarity with the pertinent documents, diaries, memoirs and journalism of her subject and an unfailingly felicitous style. But above all, she succeeds in putting a human face on that terrible conflict that spanned a generation and brought about so much change and suffering for the people she describes. Five stars for concept, and selection of sources. But I found the writing choppy and awkward (e.g., use of pronouns with very unclear antecedants), and just simple, straight factual errors (50 ships in the combined fleet at Trafalgar?) that undermine one's confidence in matters less easily confirmed. Not exactly an edge-of-a-seat read; however, a very interesting profile of life in Britain during the French Revolutionary and Napoleonic wars, including the bit of peace in between. This book certainly confirms that the past is a foreign place: 1793 - 1815 was a violent and sickly place, with a very high infant mortality rate; no wonder they had families that would make the average rabbit appear celibate. Then, when a family was in poverty and with no support it was evicted and starved to death; nowadays if a UK family is in poverty it can't afford a new mobile phone.The interaction between international affairs, the public well-being and the introduction of new inventions is well portrayed. One area I was dismayed at: so-called celebrities were worshiped just as much then as now. It took me a while to get into this book, as there are so many characters, but once I did, I really enjoyed it. I have read Sir Arthur Bryant's 3 vol magisterial account of the Napoleonic Wars. He came at it from a Whiggish perspective, so it was interesting to contrast it with this account from the opposite side of the political spectrum. I was surprised that Uglow does not mention Bryant in her extensive bibliography. Is he that on the nose in these times (pun intended)?. Perhaps post brexit he will come back in vogue.I was really impressed with Uglow's scholarship and the vast range of her sources. How she has achieved what he has is beyond me, It must have taken her forever. The finished product is well woth reading. This book is a tour de force of research and Jenny Uglow is to be commended for that. But I found it heavy-going. I think the problem for me is that, while the book progresses chronologically, it does not have a strong narrative. I was often overwhelmed by too much detail and too many people. I was motivated to read In These Times because I've been bingeing on film adaptations of Jane Austen's novels and wanted to know more about the historical context of her life and characters. While I learnt a lot about those times, unfortunately, the book did not live up to its subtitle to give me a really good sense of what it was like "Living in Britian through Napoleon's Wars 1793-1815". Sub-title: Living in Britain Through Napoleon's Wars. For many, the period will be very familiar, but in this book Jenny Uglow , through researches into many ordinary citizens' letters, journals, diaries etc., gives us a fresh and original insight into what these devastating wars meant for the British people - albeit, chiefly through the eyes and experiences of the literate, middle class, though not entirely. As with all Jenny Uglow's books, very finely written with some superb pictorial images. A quality publication all-round. Really enjoyed this -and in retrospect its kind of a 'down home' version of Hobsbawn's 'Age of Revolutions' since it links the Industrial and the French revolutions. Particularly strong on the growth of the financial sector, necessary to support the war, and through the use of satirical cartoons (a high point of British visual culture). Unfortunately we seem to have kept the former and lost the latter. Seventy short chapters means this is a bit disconnected. Readers will be interested in different chapters. For example, I was less interested in the chapters covering financial events. An interesting glimpse into the pre-occupations of time - not all of which were to do with the war. It was a period in history when the country was going through the earlier stages of the Industrial Revolution and was moving very slowly away from being ruled at the whim of the monarch. World at WarIn an era not unlike our own the Napoleonic wars went on for more than two decades, generations overlapping, one into the next. This is a great panorama of everyone in England involved or touched by it, and we can see in this era echoes of tyranny common on all sides in war, whether genuine or false. It's a splendid work and makes the ideal complement to Andrew Roberts great biography of Napoleon. We all learned about the Napoleonic wars; but Uglow looks closely at what was happening here in Britain throughout the period. She does it through the letters and diaries of a wide variety of people - a process which could be very tedious, but is wonderfully handled. The book is packed with detail and is obviously the result of masses of research. I enjoyed it very much. A vast, all-encompassing book that leaves nothing out. I would go so far as to say that, for me at least, there was, on occasion, too much detail: I got rather bogged down in some chapters. That said, a wonderful book, lovingly written. Lively history of life in Britain during the Napoleonic wars. She considers all types of people which makes for a more rounded picture of the era. The illustrations are plentiful, in color and black-and-white, and well-chosen. Jenny Uglow - Jennifer Sheila Uglow OBE (née Crowther, born 1947) is a British biographer, critic and publisher. The editorial director of Chatto & Windus, she has written critically acclaimed biographies of Elizabeth Gaskell, William Hogarth, Thomas Bewick and the Lunar Society, among others, and has also compiled a women's biographical dictionary.